It was with great sadness that I heard about Storm's passing on the radio this morning. His work has been a big influence on me for a long time although regrettably I only discovered who he was much later in life. I first saw one of his designs at the age of 9 when I wondered into a local record shop with my mother. There plastered all over the walls were posters of a grand looking industrial building (Battersea Power Station) bathed in fantastic morning sunlight with a gorgeous sky overhead in which a tiny pink pig was flying. The image had me transfixed and had I had the money (and was not with my frugal mother) I probably would have bought whatever that album was there and then just for the cover. That image and that day has stuck with me ever since and I attribute it to my love of photography that developed shortly afterwards. Looking back I realise it has had an impact on my style too, not to mention my love of skies in my photographs. 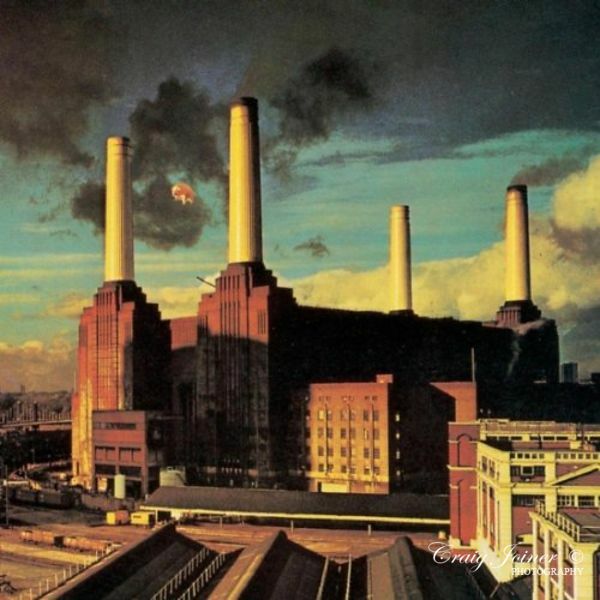 As a teenager a friend introduced me to Pink Floyd's music and I was delighted to discover that this iconic image was in fact the cover of their 1977 album 'Animals'. I have been a big fan of their music ever since and 'Animals' has always had a special place in my heart. I later discovered that Storm was the designer of covers for much of the music I have loved over the years such as Peter Gabriel, The Cranberries, Muse as well as Pink Floyd. A few years ago I bought a used Nikon FM2 SLR film camera off eBay for some personal black and while work I wanted to do and I was astonished to find the seller was Rob Brimson, one of the photographers credited to the cover of Pink Floyd's Animals. We corresponded briefly by e-mail and he confirmed he did indeed photograph the power station from a helicopter. I recall he observed, after looking at my work, that I obviously like skies! I never imagined that one day I too would be designing and shooting an album cover of my own but that is exactly what I have recently done for my daughters band. While not quite on the grand scale of Battersea Power Station (nor they as big as Pink Floyd! ), I have just realised that there is just a little of Storm's influence in the cover. It's not ready to see the light of day yet, but when it is I will probably write a short post about it. Edit: If anyone wants to see more of Storm's work then I thoroughly recommend the book 'Taken By Storm' by Storm Thorgerson which contains many of his designs along with commentary from Storm.